PAWS Animal Welfare Shelter presents Tiki and Marley as Pets of the Week in hopes that these cute cats will find their forever home together. PAWS Animal Welfare Shelter presents Tiki and Marley as Pets of the Week in hopes that these cute cats will find their forever home together. Tiki and Marley are brother and sister. 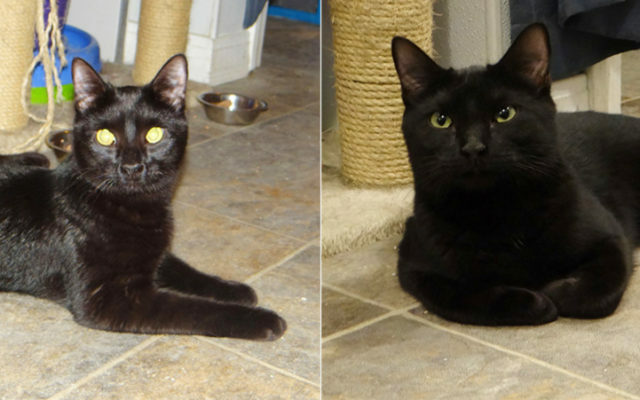 They are healthy, handsome all-black cats that love to play because they are very young. They were born in September and adopted as kittens, but were returned because their adopter could not keep them anymore. They get along well with other cats and like to be petted, but are somewhat independent. Tiki has been neutered and Marley spayed, and both are up to date on their vaccinations. To see them, visit Valley Cat Haven during open hours Saturday from 11 a.m. to 1 p.m., Tuesday from 1 p.m. to 3 p.m. or call Jean at (207) 543-7348 for an appointment.